5 1/2″ x 7 3/4″, 30 – 100 pages. Bound in pumpkin-colored cover and wrapped in three-inch white paper strip with the motto of each month’s issue. London: World Microfilms Publications. (Little magazines series, 1889-1972) [Microfilm]. Macpherson and Bryher hoped that rigorous analysis of film would help the medium achieve recognition as an artistic form. They employed correspondents in many international cities to try to globalize their pursuit. The magazine boasted a wide audience with readers and contributors in America, England, France, Germany, Italy, the Soviet Union, and Switzerland, and was published in English, German, and French. This international focus gave Sergei Eisenstein and other Soviet and Eastern film theorists a voice in the West, and helped promote children’s film and African American film. Closer to home, Bryher and Macpherson established POOL Film Projects with the aspiration of raising the standards of British film, and produced three films: Wing Beat, Foothills, and Monkey’s Moon. “As Is” Close Up 1:1 (July 1927). Reprinted (Donald 36-40). Although Scotsman Kenneth Macpherson displayed an early interest in art, photography, and writing, he eventually developed a deep attachment to filmmaking. In 1927, he helped establish Close Up and began to produce films that experimented with new techniques. Of Macpherson’s three short films – Wing Beat (1927), Foothills (1928), and Monkey’s Moon (1929) – only fragments of Wing Beat survive. His only feature-length film, Borderline (1930), took on the difficult subjects of race and gender relations. Produced in the experimental and thick style which Macpherson advocated, the film was not received well by critics. After this negative response, Macpherson withdrew to his initial interests in art and writing. Macpherson moved to New York and then to Italy where he died in 1971. Bryher was born in 1894 in Margate, Kent, England as Annie Winifred Ellerman. Second in wealth only to the royal family, the Ellerman family provided well for their daughter, who adopted the penname Bryher in 1920, after her favorite Silesian Isle. Bryher’s family stipulated that for her to inherit her share of the family fortune she must be married, so she held marriages to Robert McAlmon (1921 – 1927) and then to Kenneth Macpherson (1927 – 1947), despite her homosexuality and close companionship with H. D. With her family money, Bryher supported Close Up financially and she contributed to the magazine substantially as an editor and writer. H. D. (Hilda Doolittle) was born in Pennsylvania in 1886. At Bryn Mawr College she became friends with Marianne Moore and Ezra Pound, who introduced her to European literary circles. Although she married Richard Aldington, she also had intense personal relationships with D. H. Lawrence and Bryher for most of her life, who both influenced her work. Her imagist poems appeared for the first time in Poetry in 1913, and she was a frequent contributor to The Transatlantic Review, The Egoist, and The English Review. Although she is most well-known for her poetry, H. D. was also interested in film, and appeared in two POOL Productions films, Foothills (1927) and Borderline (1930). She also acted as an assistant editor to Close Up and was one of the magazine’s main contributors. Oswell Blakeston was the pseudonym of British writer, artist, and film-maker Henry Joseph Hasslacher. After an apprenticeship as a camera boy with Gaumont Studios, he secured an editorial position with Close Up. 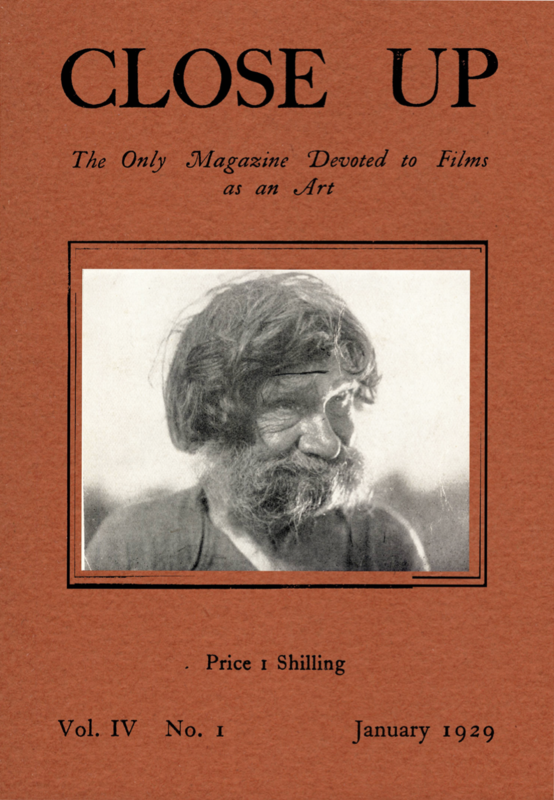 The little magazine launched his long career in the arts. In his lifetime, he published mystery novels, volumes of poetry, cookbooks, travel books, books on cinematography, photography guides, and contributed reviews and artwork to magazines. Donald, James. Anne Friedberg and Laura Marcus. Close Up 1927-1933: Cinema and Modernism. Princeton, NJ: Princeton UP, 1998. Friedberg, Anne. Writing about Cinema: Close Up 1927-1933. Anne Arbor, MI: DAI, June 1984. 3522A-3523A. Hernandez, H. “A Brief Biography of H. D.” The H. D. Home Page. 17 May 2009. 9 July 2009. Macpherson, Kenneth, ed.. Close Up: Devoted to the Art of Films. London: POOL, 1933. “Macpherson, Kenneth.” Screenonline. 27 Oct. 2004. Marek, Jayne. “Bryher and Close Up.” H. D. Newsletter 3:2, (1990) pp 27-37. “Oswell Blakeston: An Inventory of his Papers at the Harry Ransom Humanities Research Center.” The University of Texas at Austin. 9 July 2009.